Why Aren’t Muslim Countries Taking Syrian Refugees? As Europe begins to respond to the need to provide safe shelter for Syrian refugees escaping a brutal conflict, many are beginning to ask why wealthy Gulf states are refusing to accept any refugees, despite the religious, cultural and geographical proximity. Arab nations in the Gulf Cooperation Council (Saudi Arabia, Bahrain, Kuwait, Qatar, Oman and UAE) have taken extremely few, if any, refugees from Syria – “and this,” said Geoffrey Mock, Syria specialist for Amnesty International USA, “is shameful”. None of these Arab countries are signatories of the 1951 United Nations Refugee Convention, and to enter them Syrians must be in possession of a tourist visa or a work permit. Saudi Arabia has accepted around 500,000 Syrians since 2011, according to the BBC, but all of these have entered with visas or because of family connections. The only Arab countries that will accept Syrian refugees without a visa are Algeria, Mauritania, Sudan and Yemen. Gulf states have responded to criticism by pointing out the millions of US dollars of aid they have given to support refugees living in camps. In total, Gulf nations have given US$900 million from charities and private individuals. Donations to the United Nations Syria response fund show that Saudi Arabia has given US$18.4 million this year so far and Kuwait US$305 million; the US has given US$1 billion and the UK US$475 million. 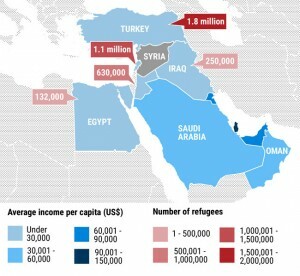 The Gulf states are some of the wealthiest nations in the world, much more so than the countries that neighbour Syria, which are accommodating millions of Syrian refugees. Jordan has taken in 630,000 refugees despite the fact that the average income is 13 times higher in the Gulf state of Qatar. The majority of Syrian refugees are Sunni Muslims, as are most people in the Gulf nations. But Gulf countries are concerned about the potential threat to security should Syrian refugees supportive of Bashar al-Assad enter their countries with the intention of carrying out revenge attacks. Gulf nations have backed rebel groups fighting Assad’s regime in Syria, which is supported by Iran, a Shiite Muslim regime. Gulf nations are also concerned about the social impact of accepting an influx of Syrian refugees where so much of their resident populations is made up of migrant workers. In the smaller Gulf states of UAE and Qatar, nationals make up around just 10% of the population. Cultural identity is controlled through the strict control of the non-Arab resident population. Visas are granted only to those who have work permits and their spouses. As soon as the work contract terminates, residents are obliged to leave the country. It is almost impossible for migrant workers to obtain nationality. Criticism of the Gulf countries’ stance has even begun to emerge from within, particularly in recent days as heart-wrenching pictures of desperate Syrian refugees permeate the global media. Saudi Arabia’s Makkah Newspaper published a cartoon depicting two closed doors: at one, a woman dressed in rags and carrying a baby in her arms, kneels begging for the door to open. This door opens the way to Europe: the yellow stars of the European Union flag circle the tiny window. At the other, an Arab man looks out of the window and shouts angrily at the Europeans to let the woman in. His own door, however, remains firmly shut and barbed wire prevents the desperate woman from even getting close. “The Gulf must realise that now is the time to change their policy regarding accepting refugees from the Syria crisis,” said Arab expert Sultan Sooud al-Qassemi. “It is the moral, ethical and responsible step to take.” Few, however, expect the Gulf nations to relent.